MOST STATES REQUIRE CHRISTMAS TREES PLACED IN A PUBLIC BUILDINGS TO BE FLAME PROOFED. 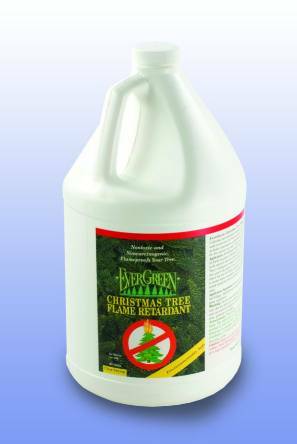 EverGreen Christmas Tree Flame Retardant received the highest rating by the state of California Fire Marshal. EverGreen earned a perfect score in test criteria conducted by an authorized independent testing laboratory. Tested and approved to meet nationally recognized tests for Christmas tree flame-proofing. Check with your local Fire Marshal for regulations. Easy to use, no mixing.